and is the best way to stay in touch with friends and loved ones. Share your location with who you want, when you want. The best way to stay in touch with friends and loved ones! Start sharing your location simply by selecting the contact from your phone's address book. 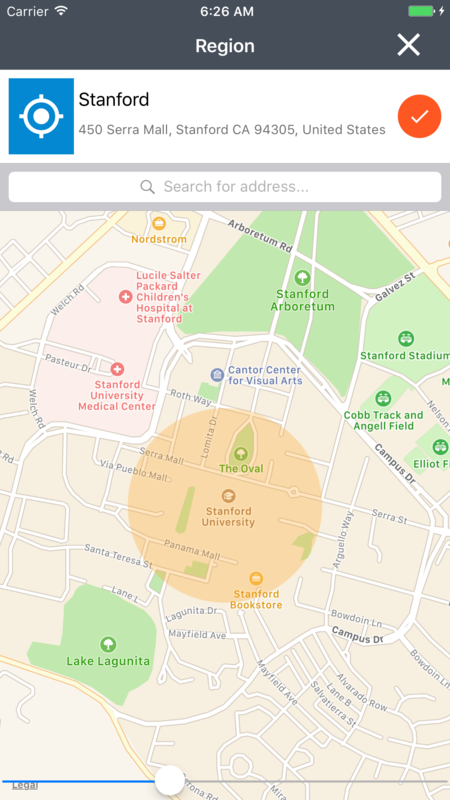 When you stop sharing location with someone, your location will be removed from their map right away with no trace behind. If you often find yourself texting “did you get there okay” or “when will you be home,” Konum is just for you. 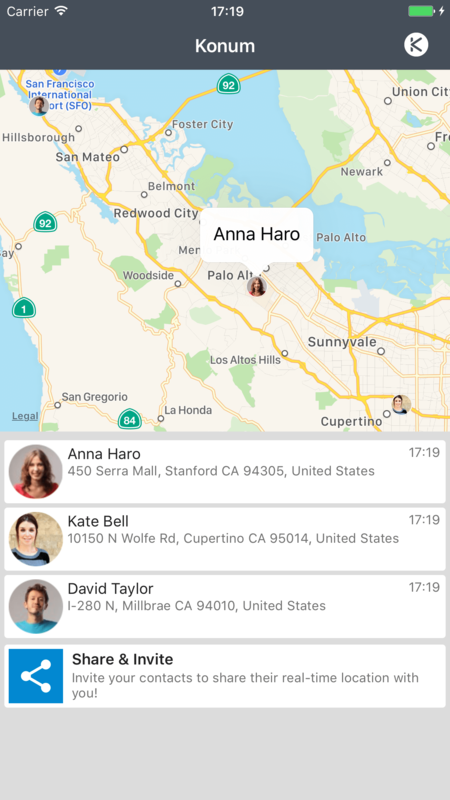 Whenever you start sharing your location with someone, they'll get a notification letting them know to check your location real-time live on the map. 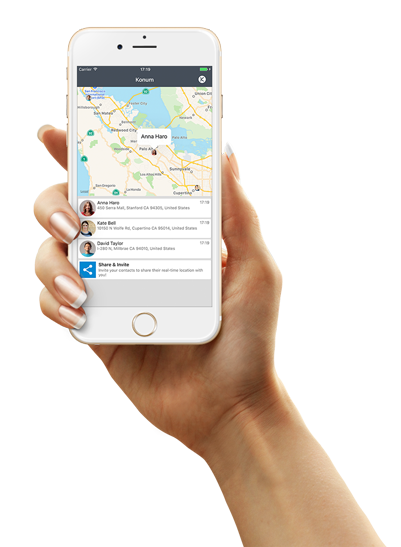 Konum is available for iOS and Android, unlimited live location tracking, messaging, 2 tracking regions and 24-hour location history are completely free! Paid premium membership allows you have some additional features such as unlimited tracking regions, location history for up to 30 days. Start sharing and tracking your friends and loved ones right now! Here you can find frequently ask questions about Konum. If you need more information or have any other question please contact us through support@konum.io email address. Q:What are those Indicators and what do they mean? person_pin Purple: No internet connection or application deleted. person_pin Red: Location service of the device is turned off or not allowed to use. person_pin Orange: The access to the location is granted only when the app is in use. person_pin Green: Internet access and location services are available. Location is up to date. Yes! Our core service is 100% free of charge to download and use. We also offer a premium subscription for a small monthly fee. It gives you more of the app you love! Q:What phones will run Konum? We work on iPhone and Android devices. While we currently don't have Windows phone app yet, we are considering to support it according to demands and feedbacks. So, please bear with us and share your opinion for it. Q:Does the app drain my battery? Konum has the lowest battery drain of all locator apps on the market. Your phone's location services will only be used if you are sharing with any contact, otherwise it will be off. 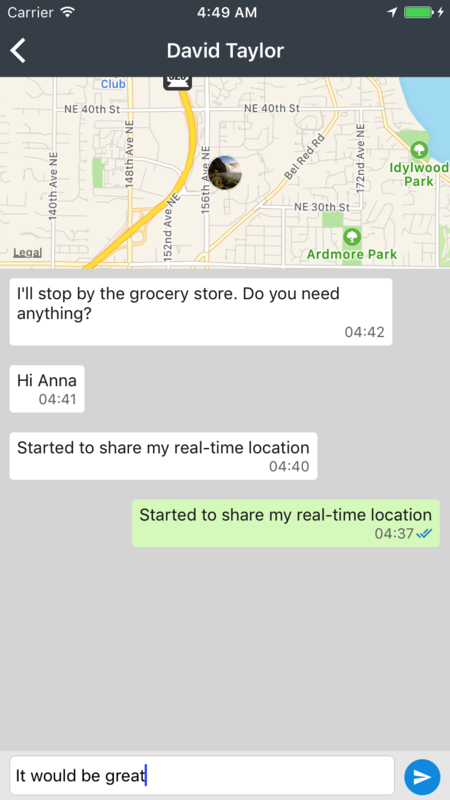 We also have an advanced algorithm that helps us decide when to wake up your phone and update your location in the case that you are sharing your location with someone. So, we never just leave your GPS on. But, every app that uses location will use some extra battery. Most users should expect no more than 10% shorter battery life when running Konum. Q:I lost connection, how can I reconnect? Connection is lost when a device is unable to communicate with the Konum server. It is also possible the device itself is not allowing Konum to update when running in the background, causing the app to lose connection. App will retry to connect again in some interval but the fastest way for you to regain connection is to terminate the app re-launch it. As long as an internet connection is present you will regain connection to Konum. Q:How do I cancel my account? Although Konum is never uses your location info if you don't share with someone, canceling account is easy if you decide to delete your account. Go to Account screen, tap on About menu item and then select Delete Account. This will delete your entire account and remove your contacts on Konum. If Konum is not working as you want it to, let us know and we can help! Q:How do I improve an inaccurate location? Accuracy depends on many factors, such as your environment and your phone. At times, a highly accurate location won’t be available (some areas might have very poor signal or no signal at all). 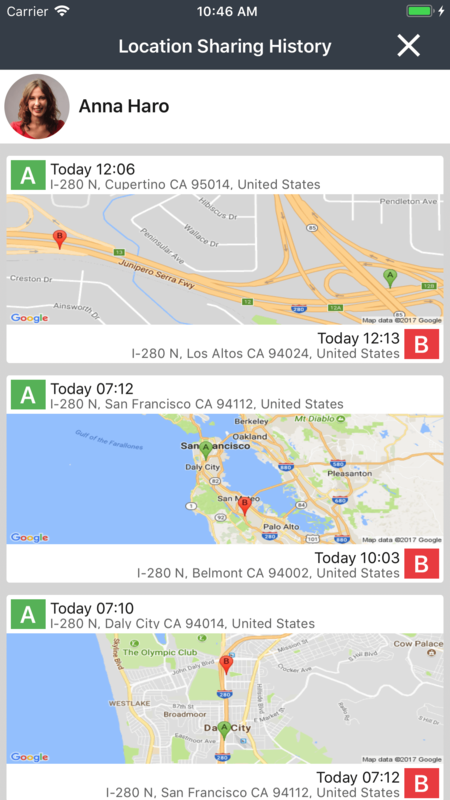 Having the app open on your phone improves your location accuracy; when the Konum app is running in the background, location accuracy will not be as high. In iOS 9: The Low Power Mode is a new feature of the iOS 9 update. Apple claims the new mode can extend your battery life up to three hours. Low Power mode reduces or turns off background app refresh which will prevent Konum from running. When enabled, the battery icon, at the top of your phone, will appear yellow. Disable Low Power Mode to maintain your Konum connection. Newer in Samsung Galaxy models and other newer Android phones is a feature called “Smart Manager" which prevents certain tasks from running if you’re phone’s been sitting idle for a while. The idea here is to save battery life by reducing power draw while you aren’t using your phone or the app. But if you have a particular app (Konum) that you want to leave running unchecked, no matter what, you can disable the "App Optimization" mode for that app. This needs to be done to allow Konum to run in the background and update regularly. For Konum to work properly you should choose the option “Automatically Optimizing” for every 3 days, the app will stop using battery power from the last usage for three days. If the app is set for "Disable For", you will stop receiving alerts from the app. If you don’t want to miss notifications from apps, it’s best not to select "Disable For". Q:How can I share my location? 5) (Optionally) If the contact is not yet a registered user on Konum, you can invite the contact to download and register as well as inform about your location sharing. Your contact will immediately start to see you on their private map. If you stop sharing by turning of the sharing switch, your location information will removed on their map right away. Q:Can someone locate me without me knowing it? As soon as you turn-off sharing switch or delete contact from your account, your location will no longer shared with that contact. 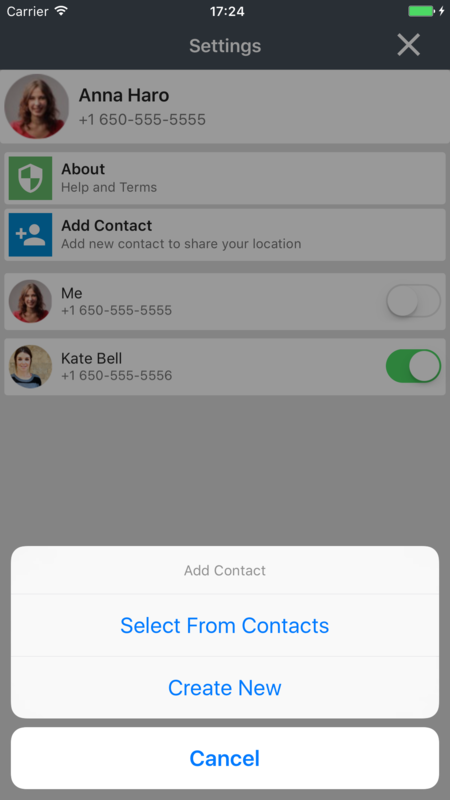 If you delete all your contacts you have added or turn-off sharing for all of them then the locations services will be stopped and your location never gathered and updated. Q:What are Regions and how do I set them up? To set up more Regions, you can purchase inside the Konum app!